1. On and off:Switch is hidden inside shoes, it’s nearby the USB port. Gently press the red button to turn on the light.Press the red button to change the color and mode.Press the button for 3 seconds to turn off the light. 2. CHARGE Tip: Easy charge like your cell phone with the attached USB charging cable. The LED outsole will be a flashing red light during charging. It takes 3 hours to complete the charge then it can provide 8~11 hours of lighting time. Notes: ANLUKE is a brand specializing in LED shoes. The LED shoes are equipped with professional packaging and free charging cable. The LED light can be recharged through the USB sort. 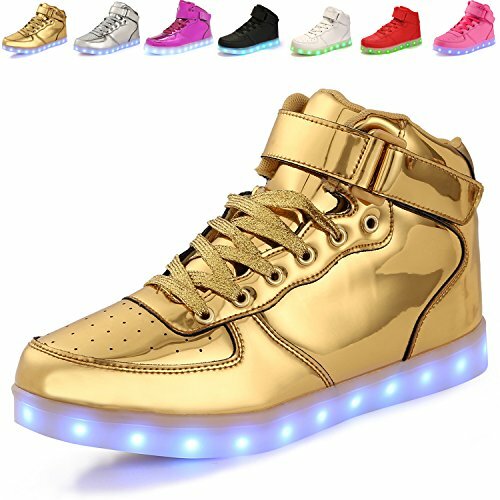 4.High-quality material,Breathable,Rubber soles,Colorful LED light.The best gift for birthday, performances, Halloween, Thanksgiving and Christmas Day and other festival and celebration. 5.Please E-mail us when you have any problem.We will try our best to solve problem.